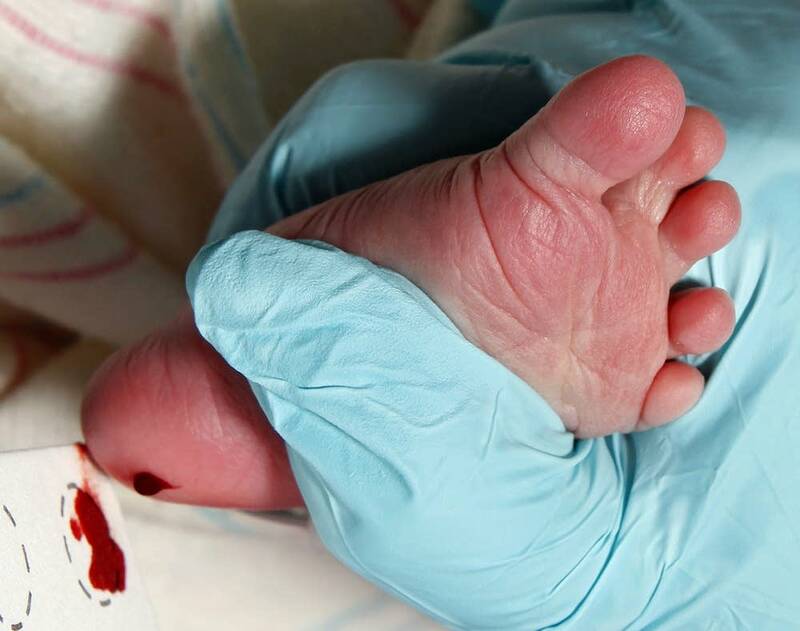 The fight over Minnesota's newborn screening law continues this week, when state legislators consider a bill that would give state health officials unlimited time to store newborn blood samples. A bill before the House Civil Law Committee on Tuesday would allow the Minnesota Department of Health to save newborn blood samples and test results indefinitely. The program tests newborns for 55 rare conditions that could be harmful or fatal if not treated early in life. Under the bill, parents could refuse their consent, but they would have to fill out paperwork to do so. In January, the Minnesota Department of Health was forced to destroy 1.1 million newborn screening cards after losing a lengthy court fight to preserve the materials. The department failed to prevail in large part because it had never secured the legal authority to hang on to the cards and test results. It also had not asked parents for permission. In 2012, while the court fight was still unresolved, the Legislature gave the agency authority from then on to store newborn screening cards containing blood spots. But, the time limit was short -- just 71 days, unless a blood spot had an abnormal result. Cards revealing potential health problems could be stored for up to two years, as could the baby's test results. The bill before the Legislature this session would throw out those time limits. It would help Minnesota rebuild its newborn screening archive, which can be a life-saving resource for some children and their families, said Nancy Mendelsohn, director of the department of Medical Genetics at Children's Hospitals and Clinics of Minnesota. "If a child presents sick we can go back and see whether or not there was an abnormality," she said. "It's a way of looking at their health overall." Mendelsohn said the archive also helps researchers validate screening results. The blood spots can be used to develop new tests to screen for other life-threatening conditions, she said. The legislation would allow parents who object to an open-ended storage policy to opt out of the health department's program. But the bill's critics say that puts an unreasonable burden on families. New parents may not have the energy or inclination to thoroughly read the newborn screening information they receive in the hospital, said Twila Brase, president of the Citizen's Council for Health Freedom, a healthy privacy advocacy group. "They have to understand that this is going to the government, that the government will store it and use it unless they say no," Brase said. "And at the time of birth, it is a very frenetic time, it's an exhausting time, parents describe themselves as being in a fog." Brase said it worries her that the Health Department is allowed to use newborn blood spots from its archive to develop new screening tests because no one knows what those future tests might be. She said lawmakers should stick with Minnesota's current screening law because it makes it easy for parents to control their newborn's genetic information. If parents want to participate fully in testing research, Brase said the law allows them to opt in. Jim Koppel, deputy commissioner of the Minnesota Department of Health, said that approach hasn't worked well in Minnesota, so far. "Our current opt in system is rather burdensome and we have very limited participation," he said. Koppel said in the two years that Minnesota has been operating under its opt in screening system only about 200 parents have given the agency permission to store their newborn's blood spot cards and test results long-term. That's out of 68,000 births per year. He acknowledged that the Health Department has not promoted the program, but said that is largely because the agency has not had the extra funding to do so. Koppel said similar efforts in other states have shown that it is difficult to encourage enough parents to participate when they're asked to opt in to screening programs.